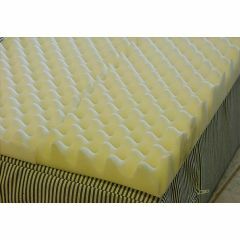 Foam Eggcrate Mattress Overlay reduces pressure to help prevent pressure sores. The Egg crate mattress pad offers cool, dry and comfortable surface for restful sleep. Improves circulation by distributing body weight evenly. 1.5 density polyfoam. Have two egg crates - one for master bedroom and one for sleeper sofa. High quality product. My 73 year old mother has back &amp; hip issues. She was unable to sleep &amp; got up stiff &amp; soar. She is now able to sleep &amp; has been improving each day. She will be having surgery soon &amp; I believe she will have an easier recovery using this product. Stays in Place. Comfortable. Holds Sheet In Place. Lightweight. Size runs small. Bought queen for a full bed coverage. Very pleased. Stays in Place. Lightweight. Thick. Have to wait for 3-5 days for eggcrate to return to it's original form, but after it's return to it's original form it's great! Comfortable. Stays in Place. Thick. The eggcrate mattress overlay is being used by my 97 year old mother in an assisted care unit of a retirement community. She has had pain problems, so it helps to give comfort for her while she is sleeping. [...] the product opened and flattened quickly, so we were able to use it almost immediately. At this point (two weeks after arrival), I would highly recommend this product. What is the exact material this foam is made from and is it fire rated? As I have been told it works great as a sound reducer and is half the cost.